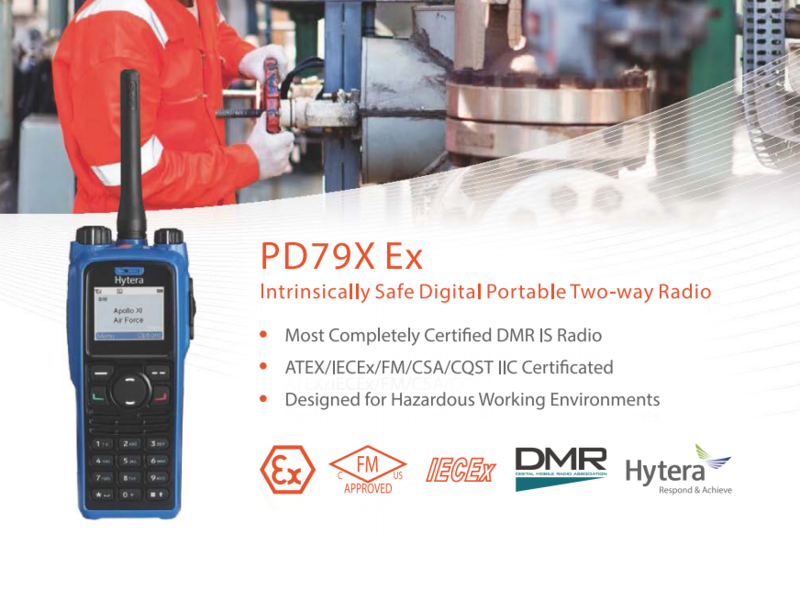 Hytera PD79X Ex is designed upon the strict requirements of European ATEX and North American FM standards. With certifications for ATEX,IECEX, the latest FM and CSA specifications. Hytera applies patent on electrostatic free design and dual material molding technology in this intrinsically safe portable. Silicone encapsulant technology prevents the internal circuits from interface with air and liquid which effectively stops the intrusion of liquid, dust and harmful gas. To disengage the battery from Hytera digital portables, the lock and bolt of the latch need to be moved along two different axes. To achieve such a high safety standard, Hytera PD79X Ex adopts optimized distributed line design on PCB, minimizing the odds of circuit fault. All the key components on the PCB are covered with shield, and the space between lines, between components, between component and shield are properly spaced , which translates to better EMC performance and less internal interference. Hytera applies patent on electrostatic free design and dual-material molding technology in this intrinsically safe portable. The static dispersive material (blue) minimizes static accumulation on the surface, thus reducing the probability of static discharge on the radio. Meanwhile the robust material (black) maximizes the ruggedness of the enclosure. To disengage the battery from Hytera digital portables, the lock and bolt of the latch need to be moved along two different axes. Such a patented design ensures no disengagement of the battery pack from the main radio in case of dropping that might cause spark.